We are currently trying to design a home and I really like the exposed timber look on the inside. How will this work out if I do Insulated Concrete Forms for the walls. Also, are there standard widths on the trusses that work better or are less expensive. I was also wondering about the pieces for the inside like the ceiling above my first floor. I can probably do standard floor joists over the basement. Sounds like you are working on a fun project. If you have are using insulated concrete forms for the walls, you might consider doing a hybrid frame with timber trusses for the roof. 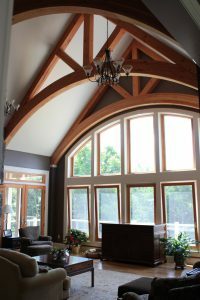 There are lots of truss design choices: http://www.vermonttimberworks.com/our-work/timber-trusses/ . Most will work well with your concrete walls. Trusses tend to get more expensive as the spans get longer. For instance, a 24′ truss will be relatively inexpensive compared to a 40′ truss, but we are able to do both and can even go up to 60′. I have copied Derek on this email as he will the point person for your project.